Bishop Eustace Prep baseball coach Sam Tropiano has 671 career victories in 34 seasons, including the last 30 with the Crusaders. What soon will become the winningest baseball-coaching career in South Jersey history began in a strange place: at a freshman basketball practice in 1981. Sam Tropiano didn’t know all that much about baseball in those days. He knew even less about basketball. And he wasn’t sure he wanted to coach in the first place. “My life was going in a different direction,” Tropiano said. “I thought I was going to get my master’s, get my doctorate, and maybe become a college professor. 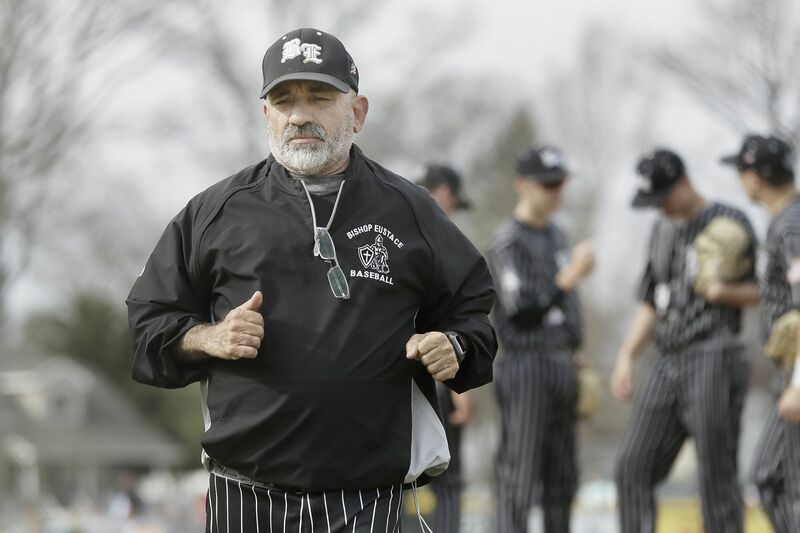 Tropiano has a 672-246 record in his 34th season as a varsity baseball coach, including the last 30 at Bishop Eustace Prep. WIth his next victory, Tropiano will pass former Delran coach Rich Bender for first place on South Jersey’s all-time list. And it all started when Tropiano, a first-year English teacher at St. Augustine Prep fresh out of Villanova University, joined Paul Rodio’s basketball coaching staff in charge of the Hermits’ freshman team. Bishop Eustace baseball coach Sam Tropiano has led the Crusaders to five state titles and six Diamond Classic tournament crowns. At the time, Rodio was in his fifth season as the Hermits’ head coach. He was just beginning to build the program into a state power. “We were still this little back-woods school,” Rodio said. Rodio is South Jersey’s all-time leader in career coaching victories in basketball with 931. And his freshman coach from the 1981-82 season is about to become the all-time leader in career coaching victories in baseball. During Tropiano’s first of two seasons with the St. Augustine basketball program, the Hermits won the Non-Public B state title in 1982. Bishop Eustace baseball coach Sam Tropiano, who is about to become South Jersey's all-time leader in career coaching victories in his sport, said he knew he wanted to pursue the profession after spending two seasons in the early 1980s as freshman basketball coach under St. Augustine basketball coach Paul Rodio (pictured), who is South Jersey's all-time leader in career coaching victories in his sport. Tropiano said his two seasons with Rodio were instrumental in his understanding of what it takes to build a successful program. In 1984, St. Augustine needed a new baseball coach. Tropiano took over a program that had gone 8-72 the previous four seasons. “I remember when he became our baseball coach,” Rodio said. “I walk in and there’s one of his pitchers with his arm in a big tub of rice. Tropiano was born in Calabria, Italy. He moved with his family to South Philadelphia at age 6, attending Bishop Neumann High School and Villanova. He played a little baseball in independent leagues as a youngster, focusing far more on soccer. “That was my sport,” Tropiano said. Tropiano spent four seasons as St. Augustine’s baseball coach. Among his players were current Hermits head coach Mike Bylone and athletic director Mike Rizzo. Sam Tropiano celebrating with his team after his 500th career victory. Tropiano moved to Bishop Eustace and was an assistant baseball coach there in 1988 and 1989. He became the Crusaders’ head coach in 1990 and has built one of South Jersey’s top programs, with five state titles and six Joe Hartmann Diamond Classic crowns. Rodio said he reflects with pride on the distance Tropiano has traveled since taking over the St. Augustine freshman basketball team in the fall of 1981. “I hope he wins 1,000 more,” Rodio said.